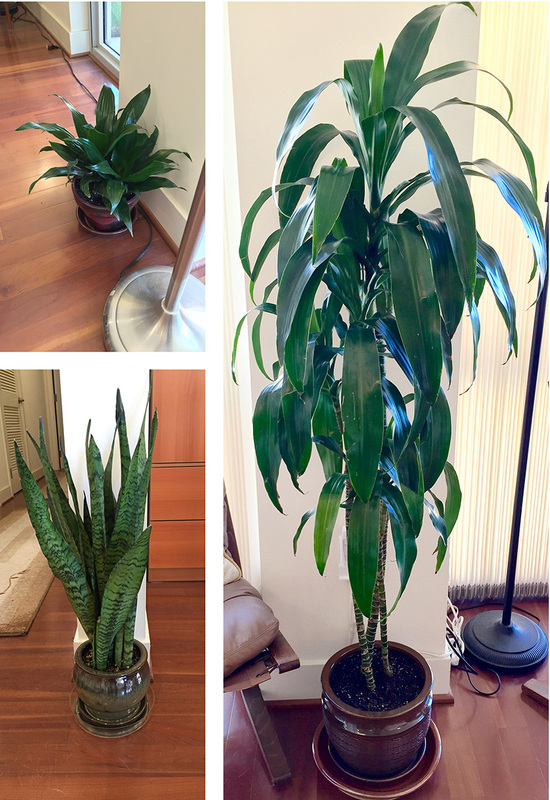 QUAKETIPS: Special challenges: Can you seismically brace floor lamps and house plants? Should you? For many years, I’ve been bracing any furniture tall enough to hurt the shortest members of the household (including those with four legs), and have been sticking down objects on surfaces that could fall or fly off and cause injury or damage. However, I’ve always been stumped by how to deal with tall floor lamps and houseplants, which would look terrible if braced by the ordinary approaches. In fact, if you look at an online photo gallery that I prepared several years ago about special challenges and their solutions, you’ll see that I basically took a pass on the floor lamps and plants and said there wasn’t all that much that could be done in some cases. Well, I’ve recently revisited these two issues and here are my recommendations. Torchieres are great in principal. However, since these typically consist of a thin pole on a base and a wide bowl on the top, they have the potential to fall like a blunt axe onto objects or people that are 5-6 feet away from the lamp. The base is usually heavy enough to make them prefer to wobble back rather than falling, but if they swing out too far from the center, they will continue to fall all the way: THWACK! The big problem is that unless you want to physically attach the base to the floor, which usually is not practical, or to suspend multiple strands of string or cable between the central pole and one or two walls, which would look silly, you are limited to putting small wedges under the base to at least encourage it to fall in one chosen direction as in the accompanying figure. The solution, in this case, has been to wait long enough until the modern lamps wouldn’t pose as much of a danger! The original halogen torchieres had heavy metal bowls on top with relatively small bases. The compact fluorescent light torchieres that initially replaced them were massive, and both styles would could fall over relatively easily with serious consequences if they fell on a person, pet, or valuable object. Fortunately, while many of today’s floor lamps still have metal or glass bowls, there are quite a few with white plastic shades (labeled as “frosted” in some lamps). Depending on the lamp, they do a terrific or mediocre job in diffusing the light so that it isn’t uncomfortable to view (see example of each in the figure below). The multi-armed “octopus-style” lamps also have plastic shades. All of these lamps are much heavier on the bottom than on the top, and in the unlikely event that one manages to fall over, being hit by the plastic top is likely to be just very annoying rather than breaking something or causing serious injury. The metal or glass lamps could easily crack your skull or kill a pet if they fell. I strongly encourage the use of these plastic shade lamps for the purposes of quake-proofing a home, with nice, lightweight, unbreakable modern LED bulbs to make them even less hazardous. Not everyone needs to be concerned about houseplants, but I can think of two main situations in which houseplants can cause seismic concerns. The first is when the plant is in a heavy pot that is on a high surface, such that it could fall down or fly off and hurt a person, pet, or object. In this sense, it’s no different from any other heavy object on a surface, although if you have standing water in drainage trenches around the pot, you might also be concerned with water falling onto nearby valuable books or artwork. Nonetheless, pots with unattached drainage saucers on top of surfaces defy the normal quake putty strategies. The second situation is specific to pet owners and occurs when the plant itself is toxic to the animals. It seems that most common houseplants, many of which are varieties of Dracaena, have toxicity varying from mild to severe if ingested by dogs and cats. From what I can tell, most pets won’t nibble on plants that are in pots on the ground, and those on higher surfaces are out of reach. (Know your pet; if it DOES nibble on things, then you need to consider this as with any other pet-proofing concerns like electrical wires, and teething puppies may be a concern.) However, if an earthquake makes a plant fall over or leaves fall to the ground, a curious pet may be more likely to nibble. And of course, when it comes to aromatic food plants that are toxic to pets, special care is called for. For example, if you have a dog, you should never, ever, ever, EVER keep a glass of green onions or garlic rooting in water on the counter unless there’s some quake putty sticking down the glass to the counter at the very least. Just like having a loose container of other dog toxins like chocolate or raisins on the counter, these situations put a dog in great danger in an earthquake zone if they are home alone for a while after a quake (see my earlier article on the topic). Getting to the point, I recently added a bunch of houseplants to my home, some short, some tall, some on surfaces; and they are all toxic to dogs and some are in heavy ceramic pots that would make dangerous falling/flying objects. I thought a lot about how to secure them, and I’ll share with you what I decided. For the floor plants, I have actually taken no special precautions for earthquakes. I adopted various strategies to make sure that water doesn’t overflow onto the floor and that moisture doesn’t transfer from the tray into the floor over the long run; standard houseplant considerations that aren’t relevant to earthquake preparedness specifically. The dog simply has no interest in eating plants growing from the ground, outside or indoors, and as long as there’s no standing water in the saucers that might tempt him to drink it, I’m not worried. Not even the larger ones will fall over in a quake because the pots are much heavier than the plants above the surface of the dirt; they will slide if they move at all. For those on surfaces, I took a few different approaches. In the figure below, panel A shows the little “lucky bamboo” that was the focus of my earlier article about stopping items from sliding even if they aren’t securely stuck down, since this one has to be moved around the table depending on how else the table is being used. That article described the easy use of a silicone sheet to make the bottom unslideable. 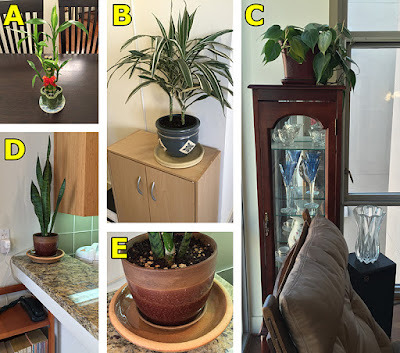 C shows a plant perched on top of a tall display case; please NEVER have a ceramic pot in a position like this without sticking it down, especially if you have children or pets. In this case, the ceramic pot has a built-in drainage saucer and the plant is in its original plastic pot that sits inside the ceramic pot, which is stuck down with quake putty. I bring the plant to the sink to water it like in the B example. Because there is no accumulation of water in the drainage trough and I’ve stuck it down with quake putty in such a way that there is still a small air space between the bottom of the saucer and the wood cabinet top, I haven’t used an extra mat. D and E show a countertop plant that has been repotted into a ceramic pot that I really like. The built-in trough is way too small, so it is sitting in the much larger outer saucer. Again, I have cemented the pot to the saucer, but in this case, it’s the bottom of the built-in tray that is glued to the saucer so I didn’t have to make any special accommodations for drainage; the inner tray will simply overflow into the outer saucer. The saucer is stuck down with quake putty, but not directly, because I put a plant cork mat (single side coated) under the saucer to protect the natural stone of the countertop from long-term moisture damage. The bottom of the saucer is epoxy cemented to the cork side of the mat (which worked), and the coated side of the mat is stuck to the counter with quake putty. So now your home can be well lit, green, and safe, all at the same time!